It's taken a while to find its way into my hands but I've finally got myself the latest Beano book (or annual as it's now dubbed) and after the superb Dandy annual D.C Thomson are offering this year I certainly had high hopes for the Beano. The covers illustrated by Nigel Parkinson are superb and the spectacular back cover portraying of all the characters on the number 75 (for 75 years) bus links in with the two spreads inside the front and back covers. Nigel certainly has his work cut out inside with him lending his hand to Dennis the Menace, Minnie the Minx and Pup Parade. 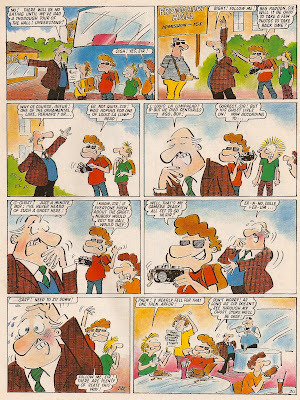 In one of the Dennis the Menace stories Nigel provides an absolutely fantastic double page spread portraying Dennis' trip to school! 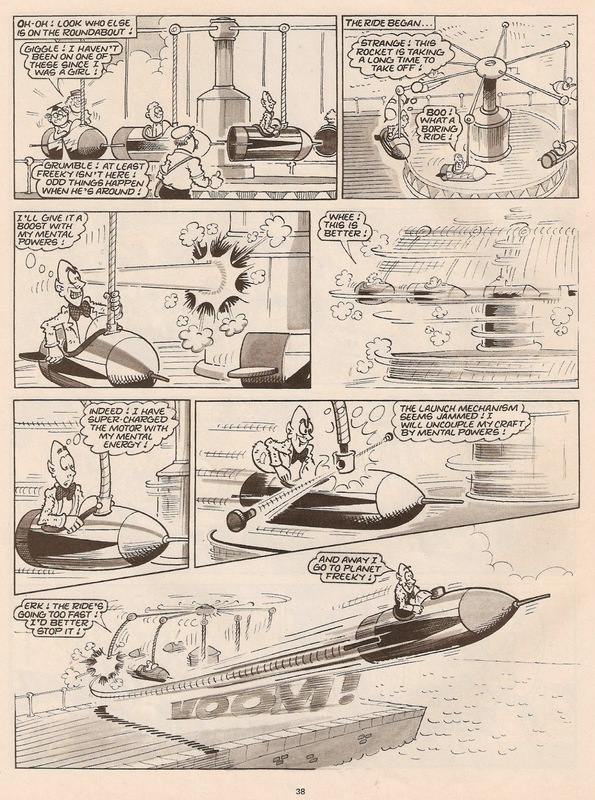 Following the Dandy annual I won't deny that I was a little disappointed by the Beano annual. 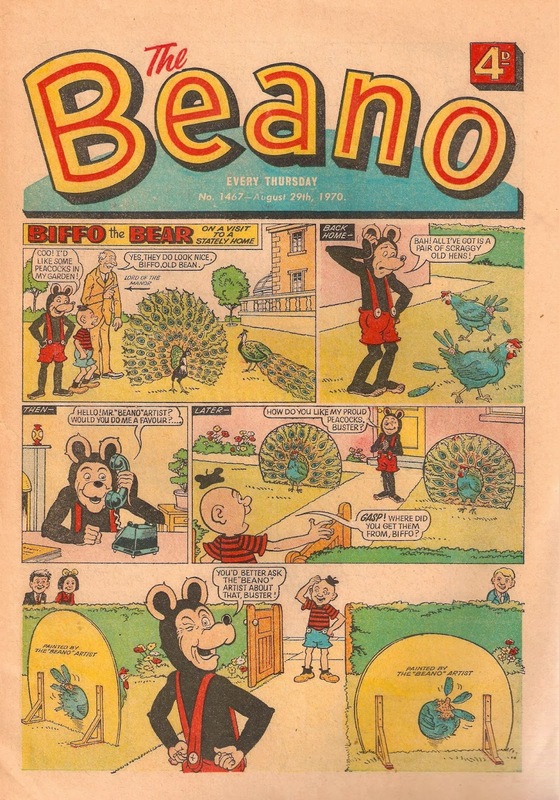 It's not that this annual contains anything bad as there are plenty of high quality strips such as Lew Stringer's Biffo the Bear and Hunt Emerson's The Three Bears (for example), but it seems to lack the same excitement or fun as the Dandy annual. 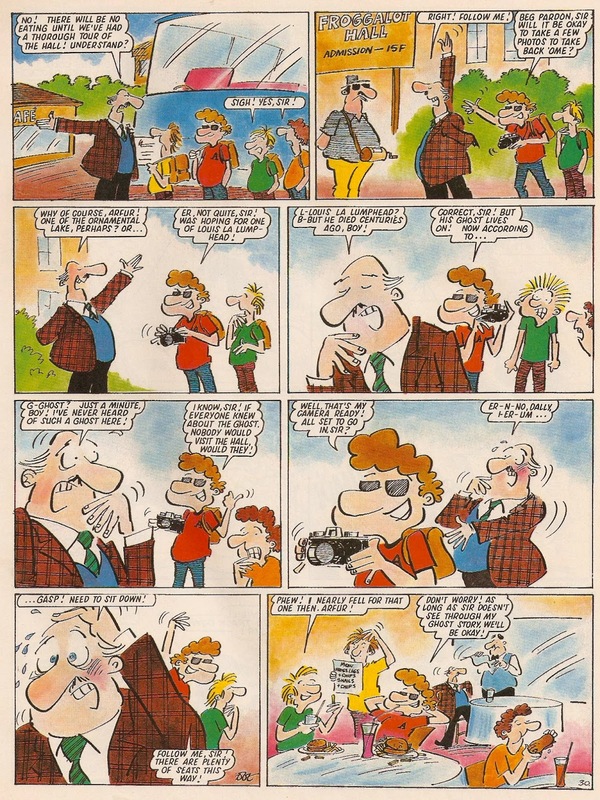 The Beano annual has hardly changed over the past ten or fifteen years whereas The Dandy has modernised and as a result the Beano annual feels sort of dated. It's still good though and I recommend picking it up if you haven't done so yet but if you have to choose between the Beano or the Dandy, I'd go for the Dandy. How The Amazing Three Became Amazing! 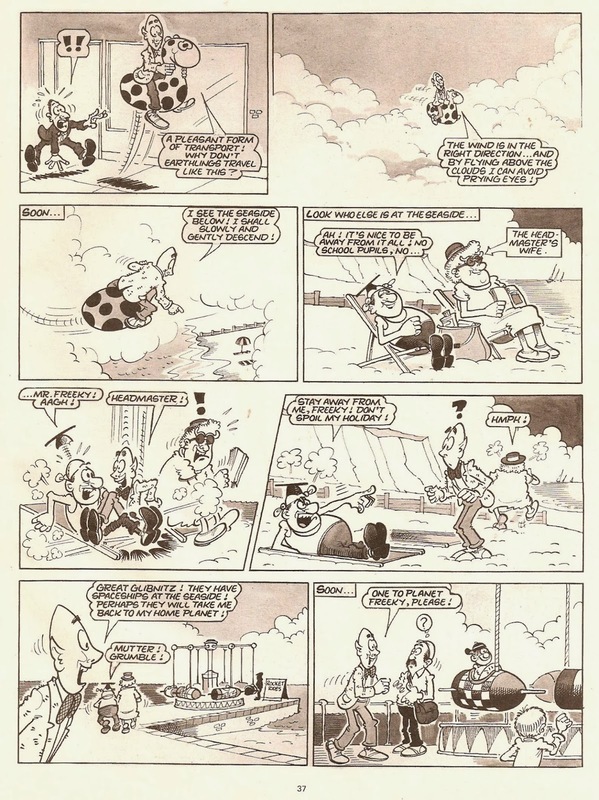 It is a very unusual strip as superheroes in Britain are scarce, especially those that follow the American style of the good guy always coming out on top. 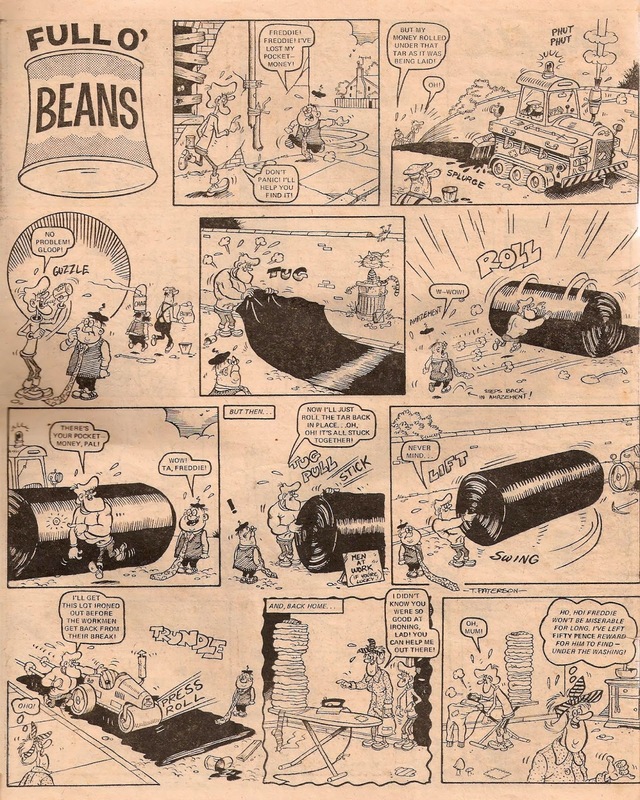 An example of a typical British superhero would be fellow Jackpot character Freddie - the star of Full O' Beans. He often dealt with small situations such as getting the washing done or bringing the shopping home in the rain, never dealing with a terrorist attack or any other equally serious scenario you'd be likely to see in Superman. Here's the strip from this issue, with art by Tom Paterson. I'm not going to go too in depth about either the Superhero genre in Britain or the difference in British and American humour but I think comparing Full O' Beans to Batman shows that the British sense of humour puts the subject (in this case Freddie) at or below the average person, in ordinary day-to-day situations, whereas in America the subject would generally be above the average person, always with the perfect line to say or whatever. I won't explain in any more detail here but it is definitely an interesting post for another time. Eagle Eye - In France! 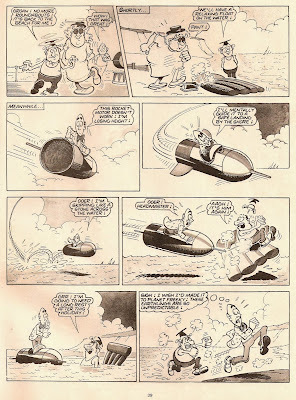 It may be little known to anybody in the U.K but Eagle Eye, another of Leo Baxendale's fantastic creations, who originally appeared in Wham was reprinted across the channel in France. Although I can't read French the artwork is still good to see all in one place and I think it's long overdue that the stories are printed here in the U.K, along with other classic comic strips. 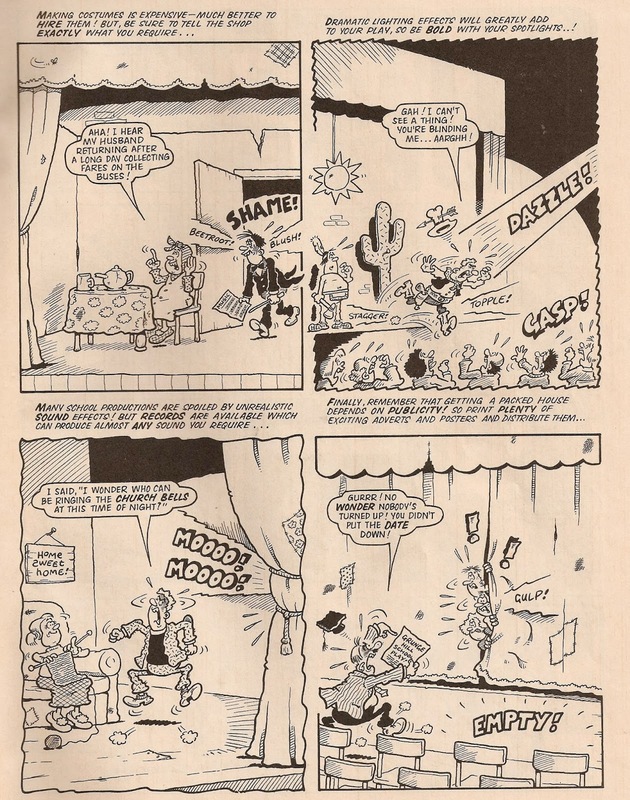 On the topic of Leo Baxendale in France I also recently discovered that his creation Willy the Kid had some strips appear in a French publication called Eppo, and that these particular strips were fresh to the paper and have never seen the light of day in English. 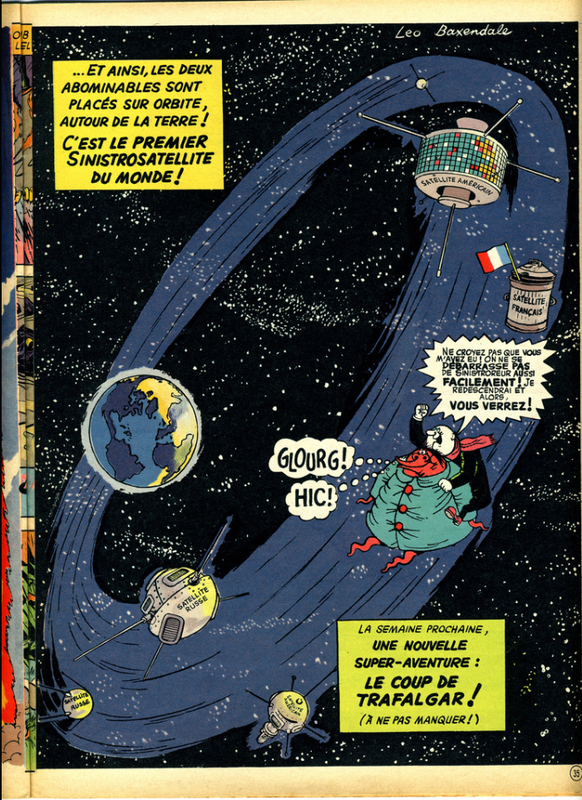 Unfortunately I couldn't find the complete strips (but I am tracking down issues of Eppo) but somebody has been good enough to scan almost 250 of the French Eagle Eye (where he has been renamed to Archibald Razmott) strips, all available in one convenient location. Please click the link below to go there! My apologies for the lack of blog updates lately but things happening in real life means I haven't had much time to update. I'm going to have a short break from Wacky Comics for now and will return on the 22nd January. So remember - put the date January 22nd in your diaries! I'll see you then. 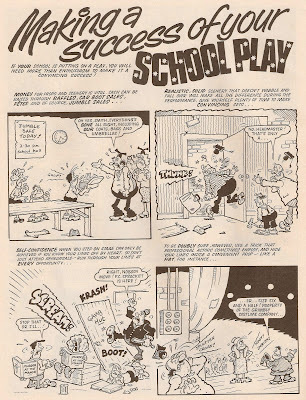 The heat and the actually sunny weather (for once) here in Auckland today has put me in the mood for a summer comic so I'll take a look at the first School Fun holiday special. 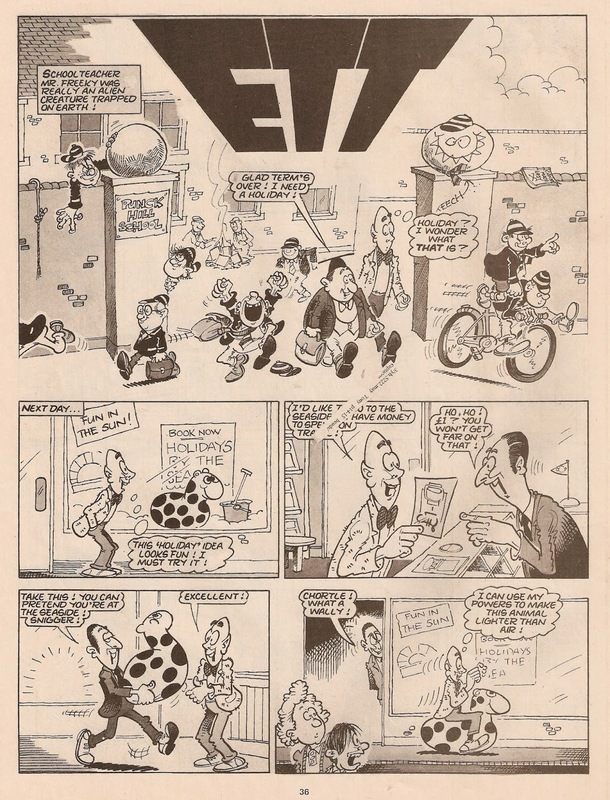 This comic came out for the summer of '84, meaning that it was sold right at the end of the weekly comic's short run. When I first came across this in a pile of musty comics I was taken aback by the quality of the wrap-around cover - it's absolutely spectacular with artwork supplied by David Mostyn. 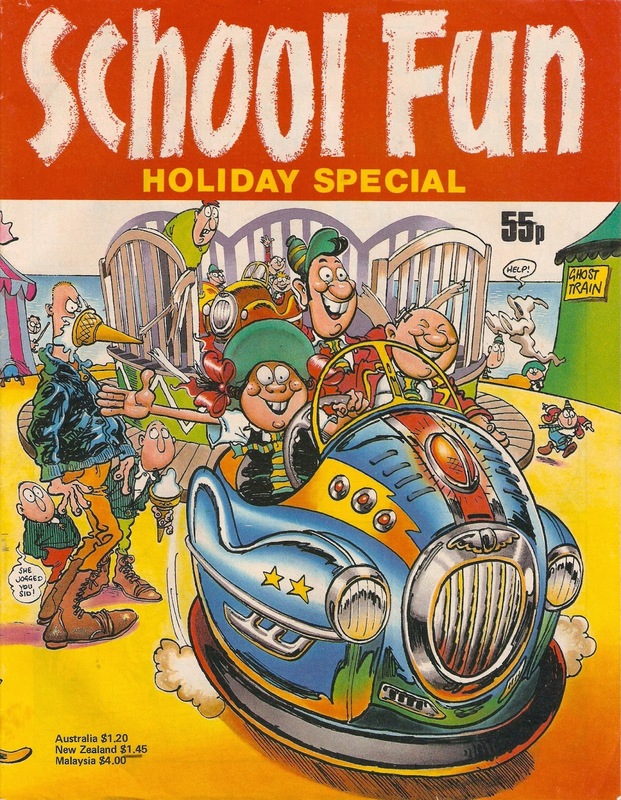 School Fun had a lot of wrap-around covers for its weekly issues and they were usually, if not always, illustrated by David. 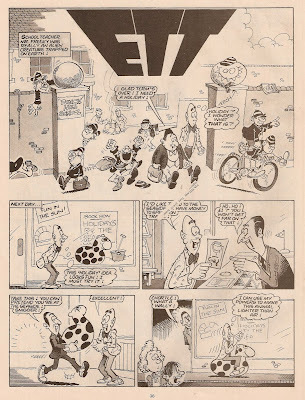 Most of the content seems to be reprints from various other comics including early issues of Whoopee so we'll begin with the School Fun originated content, and where better to start than Dave Mostyn's E.T.T (Extra-Terrestrial Teacher). 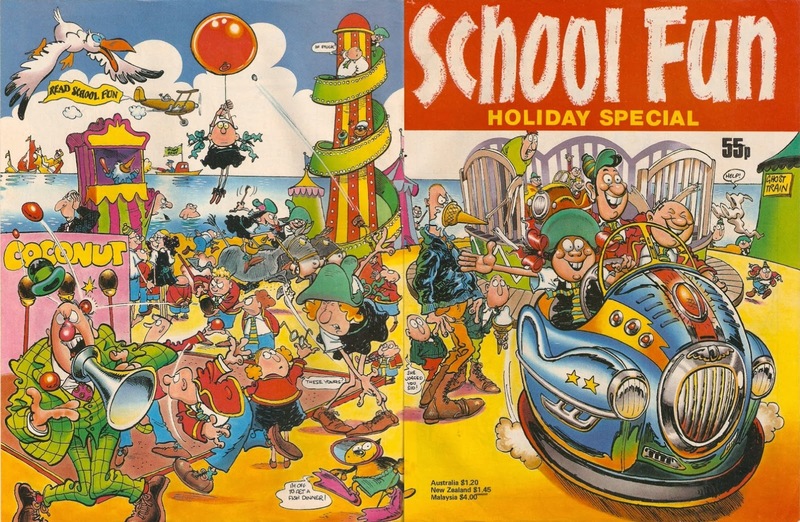 I've also chosen this strip because it has a seaside theme - a must in any holiday special! Next up is Young Arfur. 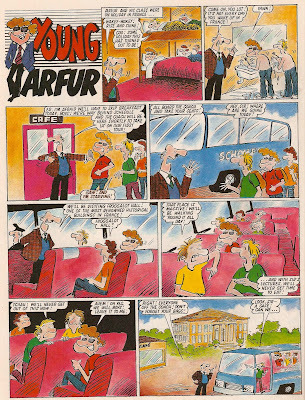 This episode doesn't have a seaside theme or even a holiday theme as Arfur is on a school trip, but the hand coloured artwork is a joy to behold so I thought it worth it to show here. 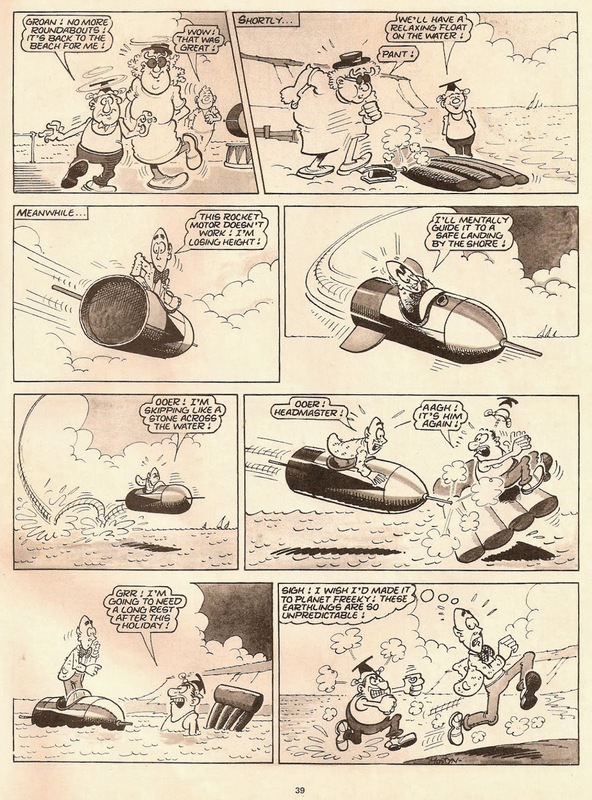 The artist is Pete Dredge, who also drew the comic in the weekly and in Buster when the two comics merged. 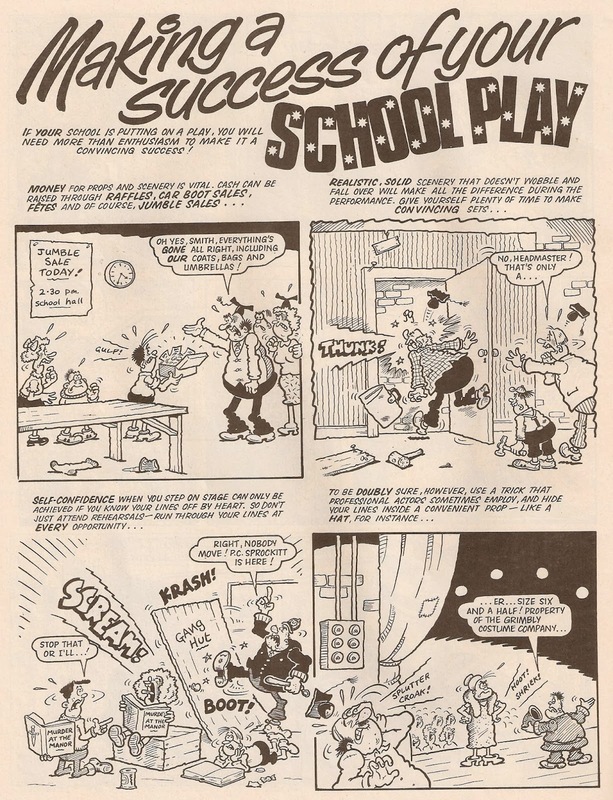 And finally, here's an interesting piece by Nigel Edwards - Making A Success Of Your School Play. 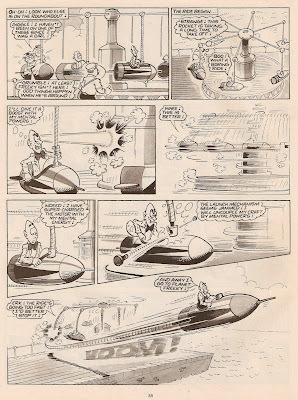 Nigel did a lot of interesting and somewhat quirky pieces for various Fleetway comics of the 1980's, which is just another reason for buying them!